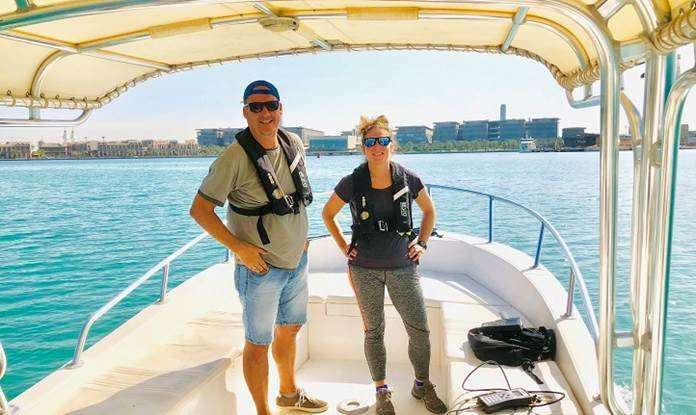 "We wanted to investigate the response to warming in three planktonic communities simultaneously—picophytoplankton, heterotrophic bacteria and heterotrophic nanoflagellates," says Tamara M. Huete-Stauffer, a postdoc in Xosé Anxelu G. Morán's group in KAUST's Red Sea Research Center. The two KAUST scientists collaborated with scientists in Spain and the United States to complete the work. "These three communities represent different elements of the food web. Phytoplankton are the primary producers in the ocean, rather like plants in a terrestrial ecosystem. Bacteria process the dissolved organic matter released from phytoplankton and other organisms, while nanoflagellates are the major predators of bacteria and small phytoplankton," explains Huete-Stauffer. The team collected samples in temperate waters off the northern coast of Spain every month for a year. They incubated samples atin situtemperature and at 3 degrees Celsius above and below. This allowed them to calculate activation energy values, which indicate how a rate, such as net growth or metabolism, might change in response to a change in temperature. "Our results showed a beautifully synchronized coherence in the temperature response of all three plankton communities although they play different roles in the ecosystem," says Morán. "Their synchronized sensitivity to temperature was largely driven by the availability of nutrients: if the organisms are strongly constrained by the availability of food or by their consumers, then future warming will have a very limited effect on enhancing their growth." These results form the basis for a general conceptual model of the response of marine ecosystems to global warming. "We have since conducted four similar experiments in the coastal Red Sea, which will serve as a test of the generality of the model in some of the hottest marine waters on Earth," adds Morán.